In an unidentified disaster zone, a group of young people attempt to leave some trace of themselves in what could be their final moments. It’s a relatively flimsy excuse for an extraordinary display of contemporary circus, which, despite the very loose narrative thread, is an excellent production. The personalities of the five young performers gradually emerge as they introduce themselves, telling us their names, personal attributes and revealing some of their many talents. Their friendly banter is woven into a seamless combination of high-level acrobatics with classical piano, live sketching and skateboarding skits. Their skills are truly fantastic and the acts themselves are generally very well conceived and directed. The group sequences are particularly spectacular, reaching gasp-aloud climaxes in the gravity-defying double pole and hoop diving acts. In an awesome display of strength and power, Antoine Carabinier-Lepine spins and rolls inside the Cyr wheel, his continually changing combinations growing ever more spectacular. Geneviève Morin and Antoine Auger have great rapport in their angsty duet, a smooth blend of amazing stunts with the push-pull dance of a complicated relationship. Atop a headless mannequin, Philip Rosenberg gracefully executes one-handed balances, while Raphael Cruz is the ultimate all-rounder, cheeky and confident. Despite the vague sense of impending doom, Traces never takes itself too seriously, maintaining a high level of youthful energy throughout, driven by an eclectic soundtrack which ranges from Broadway tunes to electronica and Radiohead. 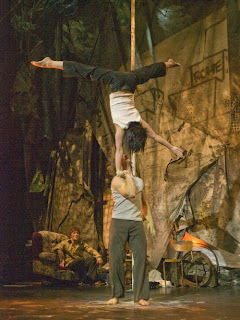 Ultimately, it’s the brilliance of the performers and their acts which makes this French Canadian circus a success.